Ford Creates Smart Jacket For Cyclists That Includes Brake Lights! Ford may be famed for introducing groundbreaking technology into cars, but a team of developers are hoping to make roads safer for cyclists by developing a smart jacket. 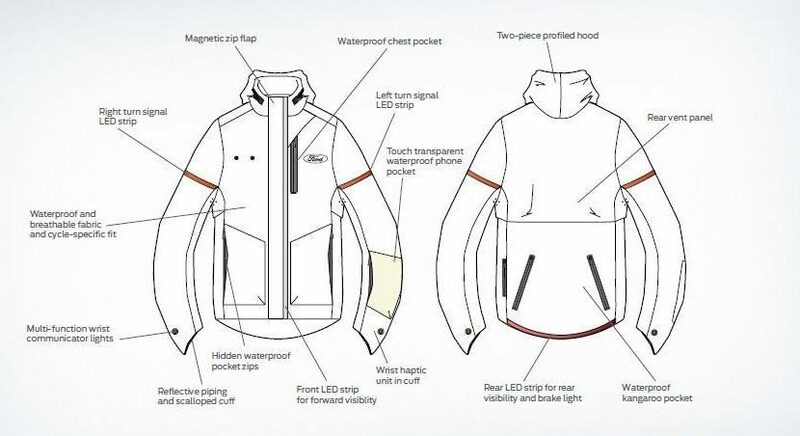 The jacket, which includes its own indicators and brake lights, can connect to the rider’s smartphone and even give them directions as to where to go. The intelligent garment has been developed by a keen group of cyclists employed by Ford, with the aim of making for a more harmonious relationship between cars and cycles on the roads. Tom Thompson, project lead for the Ford Smart Mobility team, said: “The smart jacket concept helps us to better understand how the different players that are a part of the urban mobility ecosystem – cyclists, cars, and pedestrians – can better co-exist through the application of smart technologies and how we can apply those learnings to future ideas. The smart jacket features sleeves that light up when the driver indicates that they plan on turning left or right, and the navigation app on the phone allows the sleeves to vibrate to give directions. The technology allows both car drivers to know where a cyclist is going, and also gives the cyclist a much safer navigation method. The brake light comes into operation when the cyclist slows down. The jacket also includes headphones which allow the cyclist to take calls, listen to music and navigation instructions. Almost two million cyclists are on British roads every day and recent figures show that there were 18,500 casualties involving bicycles in 2016. Find out what technology Ford has in their cars. Motordepot has hundreds of models to choose from.